On this day in 2001, all of America’s postwar bullying, lying, cheating, deceiving, extorting, interloping and specifically self-serving ways resulted in the shocking, gruesome, horrific and utterly tragic massive attack that destroyed the Twin Towers in downtown Manhattan. This entry was posted in Atrocities, World Events. Bookmark the permalink. Clearly, it wasn’t enough of a lesson. First off, let me say that I love this site and what you are doing here. I pretty much think you’re spot on and doing a fantastic thing in presenting this material to the world. That said, I think this entry is pretty callous and insensitive to the the families of the over 3,000 people who died in fear on that day. Fight the power but don’t forget your humanity and compassion. Kevin, thanks for your comment. I’m a New Yorker and, inevitably, knew people caught up in the horror. I’d also like to think that the overall ethos of On This Deity suggests that my sympathies will always naturally be with innocent victims. We are all World Citizens and thus have a responsibility to at least know what our governments perpetrate in our name. What happened on 9/11 was disgusting. But so too are America’s foreign policies, which have been responsible for the spilling of untold innocent blood all over the world. Kevin, I initially had the same reaction as you after reading today’s post. But what can be more callous than a generation of politicians who’ve latched onto this horrific tragedy for their own political gains and to push their own agendas? How many MORE lives were lost in Iraq and Afghanistan as a result of the Great 9/11 Excuse stuffed down America’s throat? We had the worlds’ sympathies and we decided the best response was to ignore everyone else and follow a path that lead to the death of more innocent civilians. A truly sad event that has only lead to even sadder events in the last 11 years. I know who did it. The person is from Keighley. 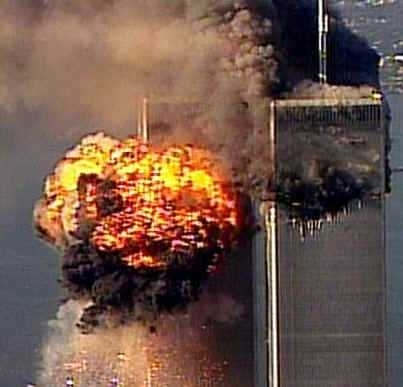 If you look very close in this picture you can see Osama himself but his much bigger than the real one..
rebuild the twin towers plzz!!!!!!! not directly affected, I still have respect for those who are. Wait til something major happens to the jokers, then let them feel the wrath of evil on their heads. There’s some irony that 9/11 will now always be remembered for the twin towers attack rather than another anniversary which would otherwise merit inclusion here – the US backed coup in Chile that removed the democratically elected socialist government of Salvador Allende. And replaced it with the fascist dictatorship of Pinochet – subsequently supported by the US and Britain for decades. A very insightful comment, journeyman. It was definitely the Kennedy moment for most of my generation, my Mams mate worked in Juliani’s office and was caught in the thick of it, only being saved from the dust cloud by a kindly soul dragging her into a shop, horrific. I’m surprised at the negative comments against posting this , its not meant as a celebration of the event after all, it is what it is: but then its a very emotive subject. Just to note THREE buildings collapsed that day WT7 being the third, despite receiving no direct impact from a plane. See http://www.ae911truth.org/ for what I consider a sober appraisal of that days events, devoid of Alien lizards and such! Michael. C. Ruppert’s Crossing the Rubicon offers an interesting perspective as well. Thanks for your very measured comment, Psych Rob. I abhor terrorism. But is it enough to state the obvious? Surely we have a duty to at least try to understand what lies at the root of such unhinged acts of desperation. I agree. A terrorist act if objectively viewed can be seen as a signifier that there are some pretty pissed off and marginalised peoples abroad upon the Earth. Surely as you suggest the way forward must be to set aside our shock and outrage and try to understand, and whilst having never been a direct victim of terrorism, it may be easy for me to say, but what’s the alternative: “a war that will last our lifetimes”? Maybe these events are part of Humanities psychological birth pangs as Stan Grof suggest or the imminence of Terrence McKenna’s Eschaton, for me it always comes back to our psychological disconnection from Nature. Of course surrendering to cynicism one could say that an understanding approach wouldn’t sell arms of guarantee the continuance of the West’s industrial lifestyle. Appreciate all your hard work Mrs. Cope. According to the documentary, the global movement based on anti-Western hatred traces to Greeley in 1949 and a church dance where “Baby, It’s Cold Outside” happened to be playing. Sayyid Qutb, a puritanical, conservative Muslim was so horrified by what he saw there (males and females touching, dancing), that he returned to Egypt to advocate a return to Sharia law by Arab nations, the rejection of modernization and democracy – and violent retaliation against America and the West for ‘corrupting’ the Arab World. A vintage phonograph record player and black-and-white pictures of a dance hall purport to represent this dramatic turning point in Greeley. With less dramatic fanfare, intelligence experts, policy influencers, religious scholars and others weigh in on the root causes, whether Islam is an inherently violent religion, what misinterpretations and bad translations have wrought, and what can be done to avoid further bloodshed.